It has been quite a while since my last post about 3D printing, but needless to say there has been a lot of progress since then. To start, the changes (and experiments) I made were small, such as attempting to print on an alternative bed material (plain glass with "ABS juice" - ABS dissolved in acetone and painted on the glass), getting a 0.5mm nozzle (which amongst other things allowed for much quicker printing at the cost of fineness), and also testing a different slicer (the program which converts a model into instructions for the printer) which generally yielded better results. From there the changes started to get more interesting. I started to realise that the wooden frame had a little too much flex in it, which greatened the possibility of shaking during printing and therefore inaccuracy. I found a design on Thingiverse for a fully printable i3 frame, and decided to give it a go. 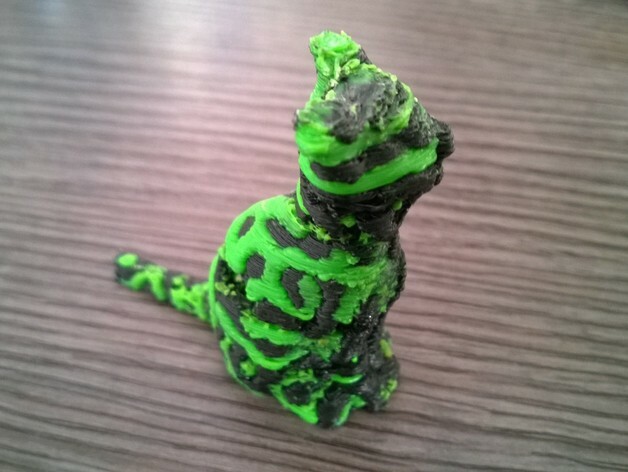 It took a while to print, but the result was quite usable. Despite this, I eventually decided to invest in a proper aluminium frame, which has given the best stability and highest quality prints yet. At around the same time I decided to start exploring more complex options in the printing process itself. Instead of experiementing with PLA (something for the future), I decided to start messing around with multi extruder printing. This opens up many possibilities from allowing multiple colours to be printed concurrently, to printing with different materials at the same time. Searching for dual extruders that had already been designed for the Prusa i3, and came up with a couple of results. I started by testing out 3DCR's design which was seemed like a good one to begin with because I already had most of the parts it required. However, when it came around to testing it I found that the direct drive the design used was unable to cope consistently with 3mm filament (which so far I have used exclusively, and didn't really want to change). Though it nearly worked, I had to conclude that I wouldn't be able to use it reliably, and so set about testing the next one, named Jims Flying Extruder. This design was even more outside the box than the first one (and I like both of them a lot). It had a couple of quirks to work around, the biggest being it was primarily designed for a horizontal X-carriage, so I ended up designing a vertical adapter that would allow it to be attached to the Prusa. Tragically I ran into the same problem as in my first attempt. Although I had it working for a while (video below), the motors (which were not the same ones as in previous designs) soon started to overheat and skip steps. I was unable to find any more designs that did exactly what I was trying to do. Eventually I settled on designing my own. The aims were simple; create a dual extruder for the Prusa i3 that would allow reliable extrusion of 3mm filament. To add to this, a requirement for any dual extrusion system is that the height of each nozzle needs to be individually adjustable, so that they can be calibrated to exactly the same height. Therefore, there had to be a mechanism to accomodate for this. But still, on top of that the design had to also be as compact as possible in the X and Y axes, since the more space the extruder takes up, the less space the printer will have to move in, meaning you reduce the effective area you can print on. With all this mind, designing and prototyping started. I finished with three distinct designs, all of which reached various stages of development, and all of which proved to be inadequate in meeting the original aims. Driving 3mm filament required the use of NEMA 17 stepper motors, which are big and heavy (and 2 of them would be needed). Furthermore, the direct drive approach taken by the 3DCR design wasn't enough to drive 3mm, meaning that some sort of gear system would be needed as well (as in Greg's Wade Geared Extruder, which is the standard one I started off with and had used so far). Once all of this is factored in, it makes it hard for the design to be compact enough so that you still have the enough room in the X axis left to make the design viable. Therefore, I decided to change the focus of the project slightly. So far, I had always intended to to keep the motors mounted on the moving X carriage. This is the simpler and more common approach, but has the problem of increasing the mass of the moving carriage, causing resonance and accuracy issues, especially at higher speeds. Bowden Extruders on the other hand, don't have this problem. Bowden Extruders are an alternative approach to driving filament through the nozzle of the printer; Instead of having the drive mechanism on the X carriage, it is moved elsewhere (fixed on the printer frame, or otherwise freestanding), and the filament is driven into the hot-end via a pipe. 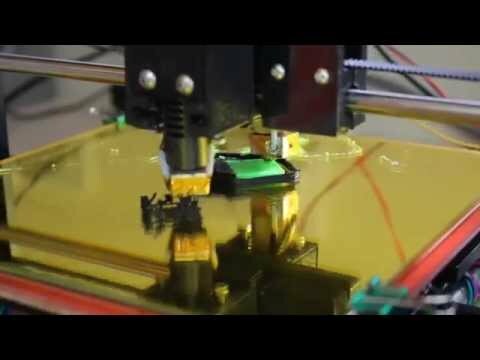 Taking this approach would solve the space and mass problem, and so allow the print head to move much quicker, and result in a much better print quality. Though I hadn't experimented with Bowden Extruders at all yet, I felt this was a good opportunity to dive in. With the motors gone, I now only had to worry about how I would attach the nozzles to the X axis, how the filament would get fed into the nozzle, and how to adjust the heights of the nozzles. For the actual drive system, I found a Bowden drive on Thingiverse that suited my needs exactly, as it was based on the same gear system in the standard Greg's Wade Extruder. The first revision of the result is pictured below. The idea was to make a part so that a nozzle could be attached to the carriage more easily, while allowing for adjustment. Also, to minimise the X axis cost, the nozzles can be mounted in the Y axis (on either side of the X axis rods). This initial design, once put together (with one nozzle) offered a very promising result, but due to only having two contact points on the X axis made it a little unstable. Doubling the carriage size solved this, and gave the final design. Some calibration and alignment later, and my first dual extrusion prints are starting to look the part. There's now a whole new set of variables to play with in the slicer settings in order to get consistent, ooze free prints which will just take time to get right. 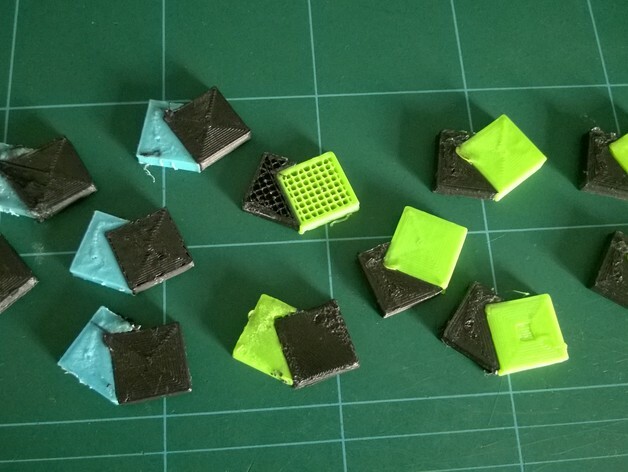 The image below illustrates the progression of quality of a simple dual colour test piece over time, and the video below shows the extruder in action. As a final test, I tried printing a more complex part. The result is messy, but it's a good start. With more experimentation the quality should get better! Following the RepRap standard, I've put the models for all the parts needed to build the extruder are on Thingiverse, and have written a full assembly guide on Instructables. Interestingly, the final design could theoretically allow up to four extruders to be used at once. Slicers can already handle this many extruders, but I don't currently have the hardware to test it out for myself. I'm hoping to seeing others take the design and work with it. A timelapse demonstration of the finished design.